I found a really great blog the other day. I don’t often share other people’s blogs, so you know it’s gotta be good! Check it out here. I found the blog after clicking on this recipe through Pinterest. I love Pinterest. I might need an intervention. Anyways, I was drooling over this recipe. Feta? Olives? Tomatoes? Artichokes? All my favorite foods! And I knew Nick would like it since it called for chicken thighs. 95% of the time I cook chicken, I cook breasts, but breasts aren’t Nick’s favorite. In this case. Preheat oven to 350 degrees. Heat the olive oil in a Dutch oven over medium high heat. 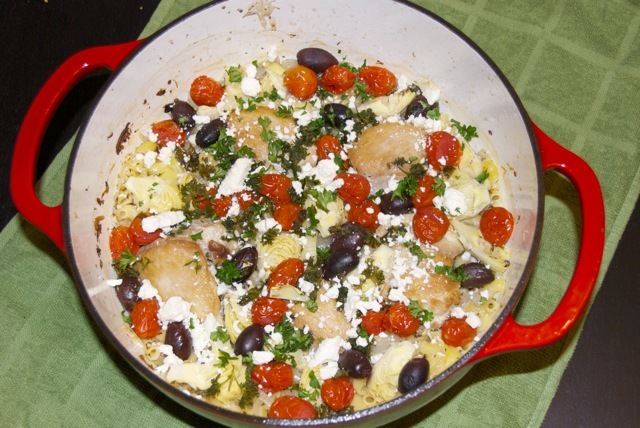 Season the chicken thighs with salt and pepper, and add them to the Dutch oven. Cook one side of the thighs for 3-4 minutes or until golden brown. Transfer chicken thighs to a plate. 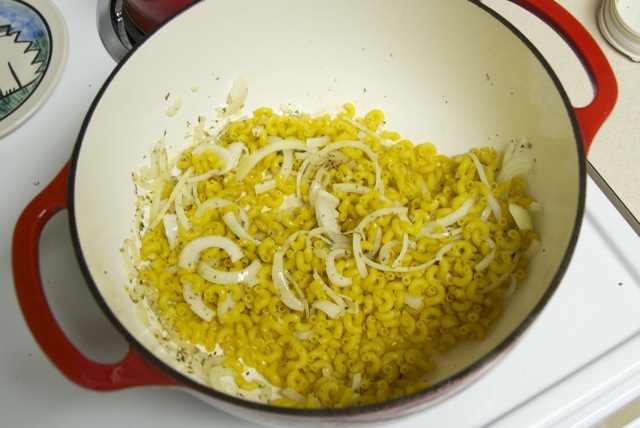 Add the onion, garlic, oregano, and pasta to the Dutch oven and cook, stirring constantly, for 1-2 minutes. Add the lemon zest and juice, and chicken broth. 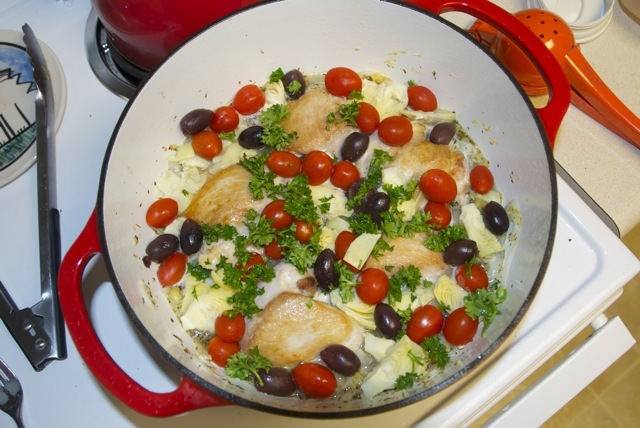 Add the chicken thighs and juices back into the Dutch oven along with the artichokes, tomatoes, and olives. Sprinkle half of the parsley on top. Cover with a lid and place into the oven to bake for 20 minutes. Remove the lid and continue to bake for another 10 minutes, until the pasta has soaked up most of the liquid and the chicken is cooked through. 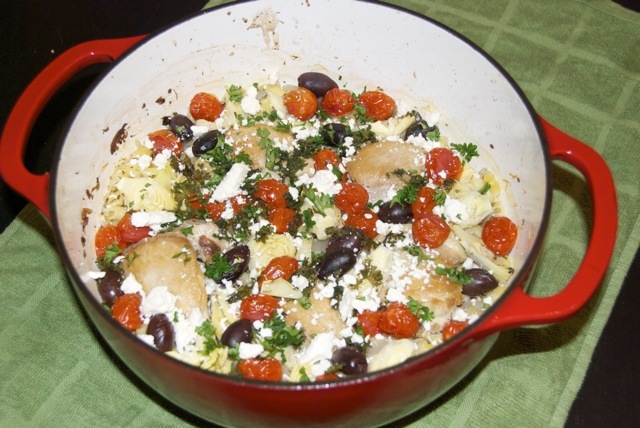 Sprinkle with the feta cheese and remaining parsley.